The Handspinner Spotlight is an opportunity for me to share with all of you some of the amazing handspinners out there in our community. It is an opportunity to see some of their work, as well as start to get to know a little bit about who they are and what brought them to spinning. 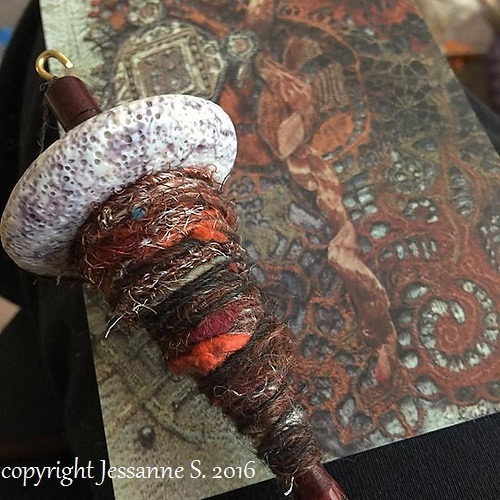 This month features Jessanne , who I started to chat with through Intagram as we commented on one another’s spinning and particularly her tapestry weavings. 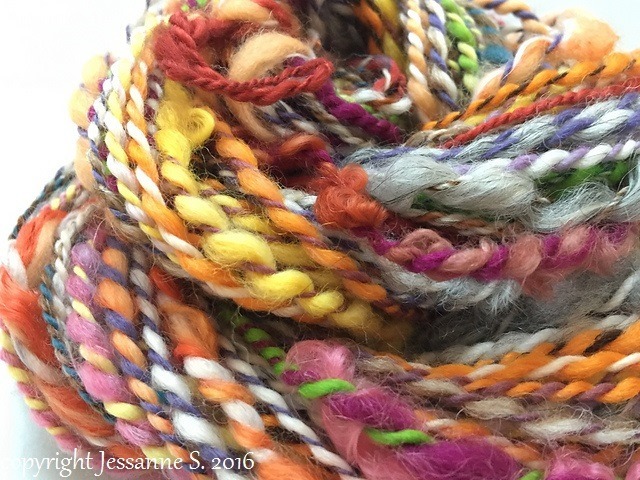 Jessanne is always sharing different projects she’s currently obsessed with from needle felting to spinning to weaving to knitting. She is truly an inspiration! 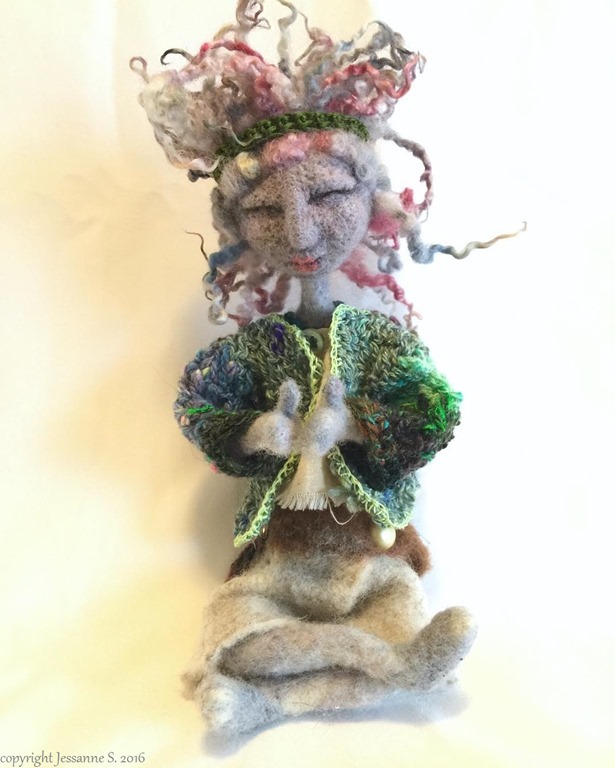 I am a 36 year old fiber artist, wife and mom to 2 kids and 2 cats in the Fingerlakes Region of NY. I love the colors of the forests and the oceans. One time I swam with dolphins in Hawaii! I came to handspinning through my mother who is a talented fiber artist. One day maybe 3 or 4 years ago she handed me a few colors of merino wool she dyed, and let me borrow her drop spindle. INSTANTLY I loved it! Id been watching my mother needle felt and wet felt for years (she’s always been ahead of the trend) and never really had a ‘need’ to get into it. I enjoy traditional yarns also, especially to knit with, and I’m currently working to perfect my consistency in a 2-ply lace weight yarn. I’m coming right along! I can NOT go without my carder. 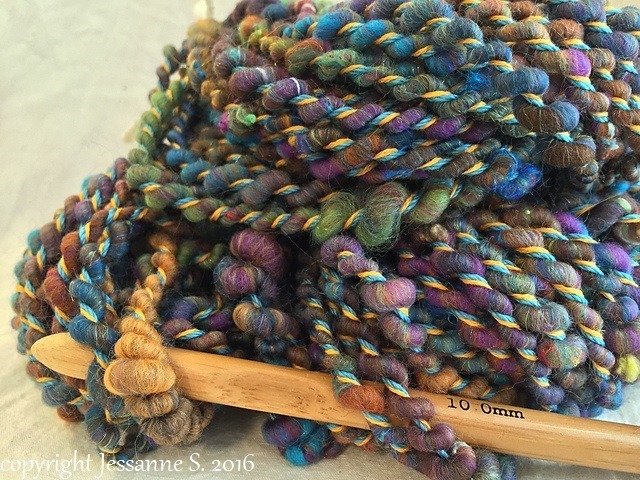 Blending colors and wool breeds into an art batt makes my heart go pitter-pat! Also, I find spinning any type of yarn from a well carded and fluffy batt makes the process so much more enjoyable and easy. Even with added locks and texture. I am a 65/35 Process to Product person. I absolutely adore having a wide range of fibers to hoard and sell to those that want unique yarns for their projects but even more I love the process of spinning. I definitely meditate and relax while I spin. And the bonus is that I have yarn when I’m done! The first ‘lightbulb’ moment was Plying!! 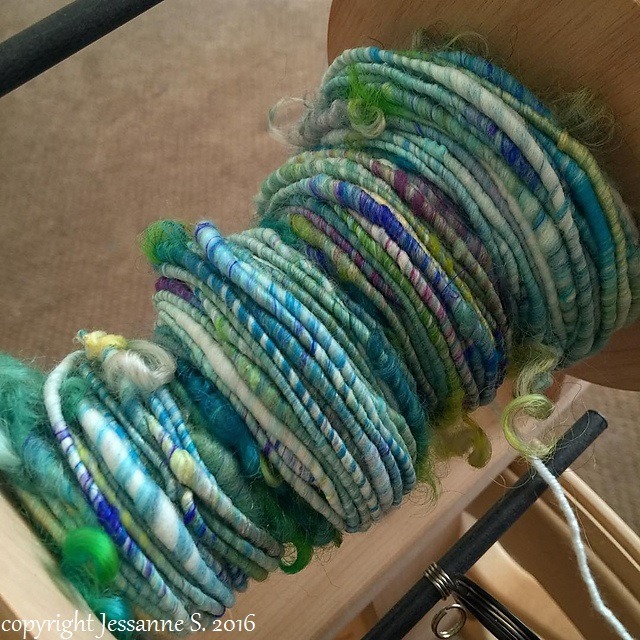 It is pretty magical even when your first singles are what I would now describe as a hot mess … plying just changes everything! I think the ‘big’ lightbulb moment was that feeling that came when I was spinning long draw at the very beginning and realized “I love doing this, I feel like I’ve been doing it for a million years!” Knowing that there was nothing more I’d rather be creating and that I could fully invest myself in this craft was a moment of artistic freedom I’d never felt before. I would say that if you ever have that feeling for whatever it is that you are creating.. don’t stop! I don’t recall who said it on YouTube (my main source of instruction at the beginning since I was teaching myself) but the absolute best thing that stuck with me in one video of a woman spinning was, “Remember, not every inch of your yarn is going to be perfect, and that is ok.” So anytime someone new asks me for advice, I try to let them know that imperfections aren’t the end of the world and to move forward without fear. 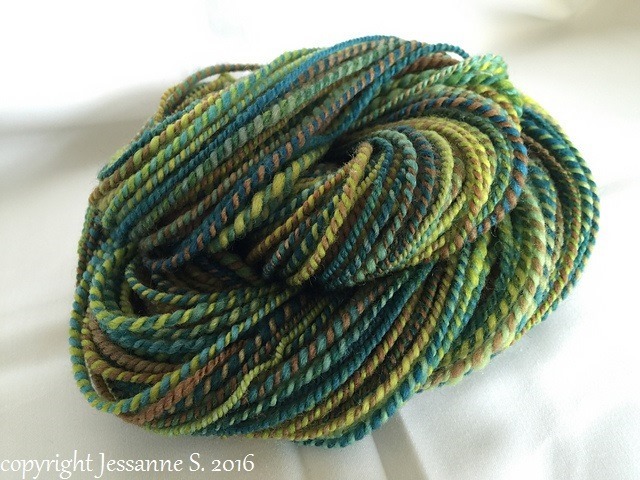 You can find me mostly on Instagram as @jessannes and Ravelry as UpStartArt. 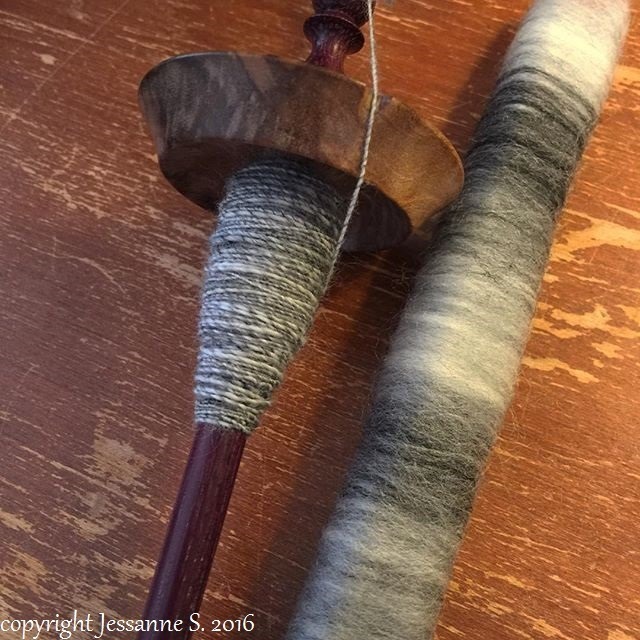 Thank you so much to Jessanne for sharing a little bit of her spinning journey with us. 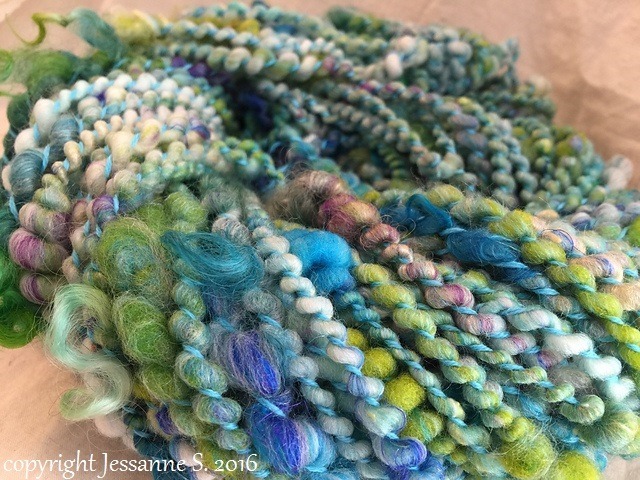 If you aren’t already following her in Instagram, please head over and check out her feed & especially her handspun tapestry weavings – they are ah-mazing! Next Post absolutely every time.